If a customer spends 30 minutes on our site, was she engaged…or frustrated? A measurement How quickly can you get the right content to your customer? A measurement How quickly can you solve the customer’s problem ? A measurement Your value to the customer. A measurement A new goal to iterate against. A new way to deliver value. A new way to evaluate succes s.
CPQ The time it takes your customer to get the information she came for. CPQ T he time it takes to for a specific customer to find, receive, and absorb your most important content. Pre ! y Garbage Garbage in a delightfully responsive grid is still garbage. If your design isn’t going somewher e, it’s going nowhere. It’s easy to give everybody what they want. It’s harder to do the right thing. Harder for us, but be ! er for the customer & bo ! om line. The web pages that time forgot. • Atomic design • Focus relentlessly on the individual interaction. • We do it for shopping carts. • We can do it for content. How quickly can we solve our customer’s problem and advance our organization’s goals? Good for transactions, bad for thoughtful content. Our news designs must SLOW DOWN the reader. Bigger type, be ! er typographic hierarchy, more whitespace. Which sites should be FAST? Which should be SLOW? of the general public, the presentation must facilitate slow, careful reading. it must be designed for speed of relevancy. 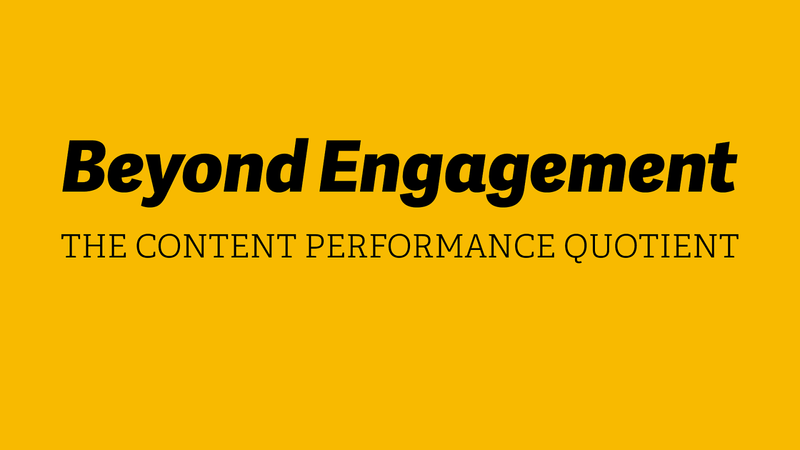 View Beyond Engagement: the Content Performance Quotient on Notist.